The decision to kill off Hofmeister and other low-strength lagers, marks the end of an era in British culture - and in advertising. As advertising icons go, George, the Hofmeister bear, lacked a certain glamour. A pork-pie hat wearing figure in a shiny velour jacket, he was invariably surrounded by a group of generic Cockney geezers marvelling at his skills with a snooker cue. 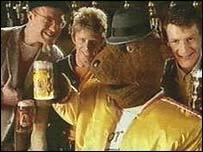 For a brief period in the 1980s the UK's drinkers seemed happy to "follow the bear". But George's antics quickly palled and the ads now look as dated as an episode of Minder. So news last week that Scottish and Newcastle (S&N) is to axe Hofmeister along with a raft of other long-neglected lager brands including Kestrel and McEwans, came as little surprise. 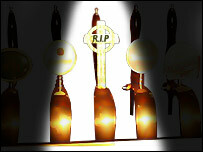 Few tears will be shed by members of the Campaign for Real Ale at the demise of these low-strength, low flavour beers. But for aficionados of Britain's drinking culture - and students of advertising - it surely marks the end of an era. The 3.2% "standard" lager is a peculiarly British institution - the product of a peculiar mix of economics and cultural factors. 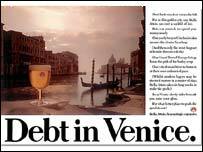 Millions of Britons returned from their first package holidays in the 1960s and early '70s with a taste for lager. This continental brew was stronger than the real ale they were used to drinking - at 5% alcohol content - and served in smaller measures than the traditional British pint pot. The breweries liked lager because it could be served from bottles and cans easier than traditional British ale. But they were worried that the British drinker could not consume the stronger beer in the large volumes they were used to - and the breweries needed to keep their profits up. Enter Hofmeister, Harp, Carling, Skol and a dozen other "standard lagers". The apparently thankless task of selling this weak and flavourless fizz was handed to the marketing department. The result was some of the most memorable advertising ever created. Heineken hit on the much copied formula of emphasising "refreshment", masking its lack of potency with its thirst quenching qualities. While Carling's long-running "I bet he drinks..." formula cornered the market in matey camaraderie and surreal humour, catapulting the brand into first place in the UK market, a position it holds to this day. What spurred the advertising creatives on was the need to differentiate between virtually identical products - or "random lagers" as one long-forgotten ad had it. That and the millions being thrown at the market by the breweries. 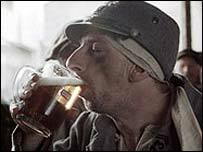 Pretty soon adland had a new mantra - "People don't drink lager they drink advertising". Marketers have always made the most of lager's "brand heritage", deliberately hyping up its exotic foreign roots - even though it is invariably brewed in the UK. The only known attempt to create a self-consciously British lager - GB - ended in failure. As a drink, it was essentially a smoother, slightly weaker version of the best-selling Stella Artois. But it was withdrawn earlier this year by new owners Interbrew - in favour of a new marketing push for old Australian favourite Castlemaine XXXX. "GB actually did quite well in the test areas, but we decided in the end that it was better to build up an existing brand, rather than start from scratch," an Interbrew spokeswoman told BBC News Online. The plain fact is Britain has always liked its lager to have a foreign accent. And this was never more apparent than in the British love affair with Stella Artois - possibly the biggest marketing triumph of them all. When Stella - a Belgian beer brewed in Wales and sold on its French heritage - was unveiled in the 1980s, it caused something of a stir in marketing circles. Its "reassuringly expensive" tag line looked like commercial suicide - and was met with anger by the company's bemused sales reps. But the aspirational tone chimed perfectly with the times. Unlike the lumpen Hofmeister devotee, the Stella drinker liked the finer things in life and was not afraid to pay for them. The irony, of course, is that Stella has become about as mass market as it is possible to be. "Managing to position something as reassuringly expensive, when it isn't, is hard to beat in marketing terms. "In fact, Stella is anything but expensive. It is on discount nearly everywhere you go," says Kevin Baker, of drinks analyst Canadean. The television ads for Stella ooze quality and continental sophistication. But they are created specifically for the UK market. Elsewhere in Europe, Stella advertising is more cheap and cheerful. It helps, of course, that Stella is considerably stronger than its predecessors. Despite initial fears, the British drinker has risen heroically to the challenge of sinking export strength lager by the pintful. "There is definitely a move towards more premium beers within the UK market, coming more into line with Europe, with a pint of beer being 5% rather than 3.5%," says Kevin Baker. "Because of the volume we drink, our lager has traditionally been weaker. But you are seeing Carling - which is still the market leader - making a point of the fact that their beer is brewed to 4.2% for a fuller flavour," he adds. What chance does Hofmeister - at a puny 3.2% - stand in this brave new world? But the weakness of the liquid is not what ultimately killed Hofmeister and the other standard lagers. Much has changed in lagerland over the past 20 years. More women are now drinking pints. Alco-pops have appeared on the scene. And some people have even stopped going to pubs altogether, preferring to stay at home - drinking wine. Even Carling has dropped the blokey double-act that dominated its TV ads for so many years, in favour of a more surreal gender-neutral approach. One recent ad saw a man cleaning out a toilet bowl with his tongue, encouraged by his watching girlfriend. It's all a far cry from sticky-carpeted locals and cheeky Cockney geezers. And that, ultimately is why Hofmeister - and the other standard lagers - had to die. Or failing that, a bear in a pork pie hat. Who puts the ooh-la-la in lager?